My daughter Lisa, called me in June and said that she and her husband were going to a wedding in Sitka, Alaska over the Labor Day weekend, and that they were flying to Anchorage the week before the wedding and going camping in Denali. She suggested that I meet them in Anchorage and travel to Denali with them. Using frequent flyer miles, I was able to book an evening flight from LAX to Anchorage on Aug. 19, and a red-eye return on Aug. 28. My plan was to fly to Anchorage, travel to Seward and cruise Kenai Fjords, then return to Anchorage to join up with my daughter and son-in-law. The next day we would take the Alaska Railroad to Denali Park. My flight was not scheduled to depart until 7:05 PM, but I was packed and ready to go by noon, so my daughter Julie picked me up and brought me to the Fullerton train station. From there, I took Amtrak to LA Union Station, where I caught the Fly-Away Bus to LAX. After killing several hours at LAX, the flight boarded and took off on time, but due to headwinds, our arrival in Anchorage was not until about Midnight, rather than the scheduled 11:22 PM. I did not have any checked bags to collect, so upon exiting the plane, I took out my cell phone to call the hotel for pickup. I then realized that I had forgotten to turn off my cell phone for the flight, and the phone had spent the five hours of flight time searching for a cell signal, so the battery was now dead. So it took me another ten minutes to find a land line phone to call the hotel. I finally arrived at the hotel (Anchorage Ramada) at about 1:30 AM. Today I travel to Seward. I would have preferred to take the Alaska Railroad rather than a bus, but the train to Seward leaves Anchorage around 6:00 AM, and given my late arrival last night, I didn’t think that an early departure would work. So I had a reservation on the bus, which leaves from the Anchorage Museum at 3:00 PM. This gave me some time to explore Anchorage. The bus travels along the Turnagain Arm on the Seward Highway, passing beside the Cook Inlet and progressing to the Kenai Peninsula. The trip is 127 miles and takes a little under three hours. The following four photos are of the Cook Inlet and the Kenai Peninsula, taken from the bus. The bus delivered me to my hotel, the Seward Windsong Lodge, located a few miles out of downtown Seward. The Resurrection River flows in front of the hotel, on the other side of the highway. This morning, I took the hotel shuttle to the small boat harbor, from where the Kenai Fjords cruise departs. I checked in for my cruise, which was to depart at 11:30 AM, and lasts approximately six hours. The following pictures were taken from the Glacier Express cruise. The cruise included an all-you-can-eat buffet consisting of prime rib and locally caught salmon. When we returned to port, I caught the shuttle back to my hotel, arriving at about 7:00 PM.. Still full from lunch, I skipped dinner. Today I am going on a tour to the Exit Glacier, which is about an 8 mile van ride from my hotel. Exit Glacier is the only glacier in the park accessible by road. It, like the other Kenai Fjord glaciers, originates in the Harding Icefield. The Exit Glacier is rapidly retreating at a rate of over 40 ft/year, and last year, with an unusually mild winter and warm summer, it retreated over 100 feet. If you want to see it, don’t wait too long. The following pictures are of Exit Glacier, its river and its moraine. After the Exit Glacier tour, I checked out of the hotel and took the shuttle to downtown Seward, where I had a late lunch before proceeding to the train station for the 6:00 PM train back to Anchorage. I found the scenery from the train to be significantly more spectacular than that viewed from the bus, in fact the route from Seward to Anchorage is considered by many to be the most scenic on the Alaska Railroad. After departing Seward, the train climbs into the Kenai Mountains and passes Kenai Lake. It continues on to Grandview Pass, Bartlett Glacier and Spencer Glacer. The train then decends and travels along the Turnagain Arm and the Anchorage Coastal Wildlife Refuge On our trip back to Anchorage, a Moose was spotted in a meadow, and the engineer stopped the train so that all the passengers could get a look and take pictures. The following photos were taken from the train on the trip back to Anchorage. The train arrived in Anchorage shortly after 10:00 PM, and I proceeded to my hotel, which was a short walk uphill from the train station. As I checked into my hotel, I got a call from my daughter, Lisa and son-in-law, Jon, who had just checked into their hotel across the street. They came over and we visited for a while, making plans for the next two days. This morning, we walked to Snow City Cafe, a restaurant recommended in Lisa’s guidebook, for breakfast. We had a 45 minute wait. The food was good, but who waits 45 minutes for breakfast; eggs are eggs. After breakfast we walked to the train station, and then along Ship Creek where salmon can be seen. Lisa and Jon had to drive to the airport to pick up some friends who were going camping with them in Denali. While they were gone, I visited the Anchorage Saturday Market and Festival, which was close to my hotel. Lisa and Jon returned from the airport with friends Elizabeth and Brian, and we spent the rest of the day exploring Anchorage and having dinner. Today we take the train from Anchorage to Denali, which leaves Anchorage at 8:15 AM. We are all booked in Goldstar Class, which features large picture windows and a unique upper level outside viewing platform. One of the most spectacular sights on the trip is the Hurricane Gulch trestle. The train slows to 10 mph to cross the trestle. The creek is 296 feet below and the bridge span is 914 feet. The Riley Creek bridge, located just before the train enters Denali Park, is the second highest and third longest on the railroad. The following photos were taken from the train on the trip from Anchorage to Denali. We arrived at the depot a little before 4:00 PM, and found the shuttle to our hotel, The Denali Bluffs, waiting in the depot parking lot. We checked into the hotel, and later went out to dinner. Since we would be going our separate ways tomorrow, we said our good-byes before retiring. My Denali Park bus tour was scheduled to depart from my hotel at 6:20 AM, so I requested a wake-up call for 5:00 AM. I never got the call, thanks to a broken phone in my room, but luckily, I woke up by 5:30 AM and was able to catch the bus. I didn’t have time to get breakfast, but I had a piece of leftover pizza from last night that I consumed on my way to the bus. I thought that I had seen the last of Lisa and Jon for the trip, but their bus to the Wonder Lake Campground, was right behind my tour bus, and we kept stopping at the same rest stops, so we saw each other several times during the morning. Our bus traveled 62 miles into the park, and we saw a variety of wildlife and scenery. The following photos were taken from the bus tour in Denali. I got back to the hotel around 3:00 PM, had dinner, and explored the small town of Denali outside the Park. I should note that, due to the constant cloud cover, I never did see Mt. McKinley, either on the train to Denali or on the Denali Park bus tour. I did, however, see it from Anchorage, but at that distance, it was not too impressive. Today I take the train back to Anchorage. Since the train does not leave until 12:30 PM, I have a few hours to explore the Park Visitor Center, which is right across the street from the train station. The Visitor Center has some very interesting and informative exhibits, and is well worth a visit. 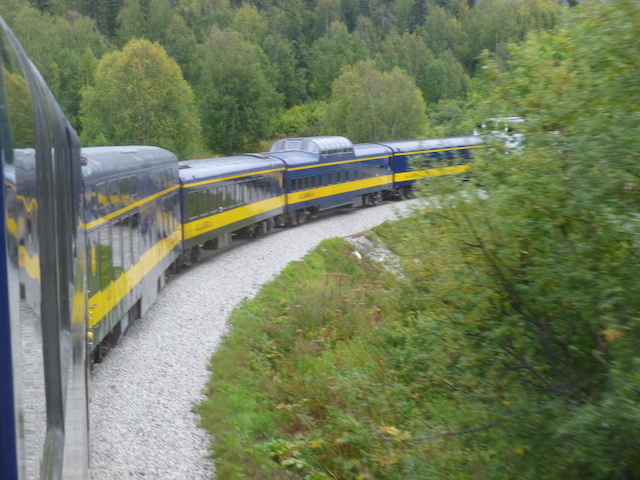 Our train to Anchorage, which originated in Fairbanks, arrived at Denali Depot a little after 12:00 noon. I boarded Car A and went to my assigned seat in the Goldstar Class Car, which has panoramic windows and an outside viewing platform. The train consisted of 2 engines, baggage car, 2 Goldstar Class Cars, Snack Car, Explorer Class (Coach) Car, Explorer Class Car with dome, Explorer Class Car, and 2 Private Cars carrying cruise ship passengers. We could not go into the private cars, and the private car passengers were confined to their own cars. The following photos show details of the train’s interior, as well as scenery from the train on the trip back to Anchorage. One glaring difference between the Alaska Railroad and Amtrak is that the Alaska Railroad lets you stick your head out the window. The Goldstar Class car has the outside viewing area, and the Explorer Class cars have open vestibule widows. If you touch a vestibule widow on an Amtrak train, they have a fit and threaten to throw you off the train. It can be seen from the photos that the Explorer Class cars were virtually empty on this particular trip, which is surprising since Goldstar Class, which was probably 75 percent full, is significantly more expensive than Explorer Class. We arrived back at the Anchorage Depot around 8:00 PM. I again made the uphill trudge to my hotel, checked in, and later went out for a light dinner. Today is the day that I have been dreading. I have to check out of my hotel by 11:00 AM, but my flight home doesn’t leave until 12:50 AM tomorrow morning. I am too old for red-eye flights. When I got up, it was raining outside, so I went down to the hotel work-out room and used the treadmill for about an hour. By the time I finished, the rain had stopped. I went up to my room and showered and packed, and checked out at 11:00 AM, leaving my bags with the hotel for pickup later. I then went to the Snow Goose for an early lunch, and then took a walk on the Coastal Trail. I walked the Coastal Trail for about three hours and then went back to the hotel for my bags and a ride to the airport. When I got to the airport, I still had nine hours to kill before my flight, so I decided to buy a one-day pass to the Alaska Airlines Club. The one day pass usually costs $45, but for some reason they had a limited time special rate of $35. I didn’t complain. The club had light food such as salad, soup and snacks such as crackers and cheese, chips and dip, etc. In addition to the food, drinks were complementary (limited to three complementary alcoholic drinks). Plus, this gave me a place to safely store my bags if I wanted to walk around the airport. The flight left on time, and I arrived at LAX at about 7:00 AM on Aug. 28. I took the Fly-Away bus to Union Station and Amtrak back to Fullerton, arriving about 10:25 AM. Julie was there to pick me up and take me home.